Do You Have a White Wedding Dress with Yellow Teeth? Pearly white decorations, a gorgeous white dress, and dull teeth? Something just isn’t adding up! When it’s your wedding day, whether you’re the bride or the groom, you should have sparkling teeth that you feel great showing off. Brighter teeth not only help you to feel better about yourself, but they can help your photos look great for your big day. After all, your wedding day and the photos that come with it are memories that will last a lifetime. Plus, when you have the dazzling smile you’ve always dreamed of, you are more likely to care for your oral hygiene. There’s no better way to start off your marriage than with gorgeous teeth and fresh breath! 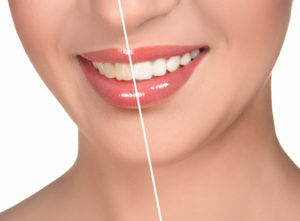 If you want your smile to truly look better for your big day, you should rely on your local cosmetic dentist. You’ll receive the results that you really want in a safe, monitored environment. Plus, you won’t have to waste time with over the counter products that hardly make a difference in the shade of your teeth. Simply schedule a visit for you and your partner to visit our office. In your single appointment, you and your loved one could have a smile up to 8 shades brighter with professional-grade Kor teeth whitening! With wedding season among us, it’s important to get all your cosmetic treatments out of the way. It’s time to focus on planning your wedding rather than trying to remove stains on your teeth. Let our dental office help you! Here at Skylands Family Dental Care, we love seeing new love birds visit our office. Not only are we able to help them feel better about themselves in a single visit, but we take pride in helping relieve some of the stress that comes with wedding planning. Let us give you a helping hand and prepare for your wedding day!